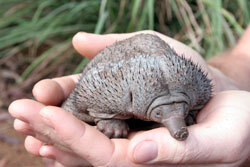 The echidna has spiked the poll in our Australia Day survey to decide our cutest baby animal. The miniature monotreme had the competition licked, snaring 26% of the vote to be judged the cutest native critter in our nation-wide poll. Not to be left too far out on a limb, the koala was voted our second cutest baby animal with 22% of the vote while the possum was hanging strong in third place with 20%. Animal lovers were less inclined to want to cuddle up to the tiny Tassie devil, who came fourth with 15% of the vote, followed by the emu (8%) and the kangaroo who leapt to last place with just 3%. The same poll conducted in the USA produced different results with the koala sitting on top of the tree with 48%, the kangaroo bouncing back to tie with the possum in second place (16%) followed by the echidna (7%), the Tassie devil (6%) and the emu (3%). “It just goes to show that beauty is in the eye of the beholder,’’ said Dr Mark Perissinotto, the head vet here at VetShopAustralia.com.au. Thanks to everyone for voting on our poll and don't forget there is only three days left to make a purchase and receive your free Proud Aussie Pet Owner Sticker! Update: This is not an Echidna! Isn't that a photo of a hedgehog? That picture is not an echidna. It's a baby hedgehog. How embarassment. We stupidly believed Google when it turned up a photo of a baby hedgehog in response to our search for baby echidna photos (try it yourself!). Thank you to all those who pointed out our error and we have now replaced the photo of a cute (but not native) hedgehog with Puggle, the baby echidna born at the Perth Zoo in 2007! 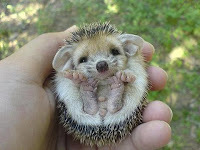 but hedgehogs dont have ears like that, Do they? The ones i have seen dont any way. So what is it and were is it from,please?